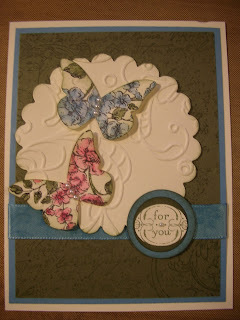 This card was one of my most popular cards for swapping. It was my favorite. I reworked this card from a card I recently prepared for a workshop. The butterflies were stamped with the Elements of Style stamp set, colored with the Aqua Painter and inks and then cut out with the Beautiful Wings embosslit.